Not only do I love buying shoes, I also love designing them! So I was very excited when Zazzle started carrying Zipz Shoes! (They had another brand of shoe a while ago, but stopped carrying them. 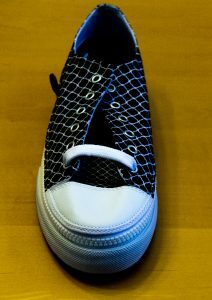 In case you don’t know, Zipz shoes allows you to separate the cover from the base by unzipping them. The reason for this is since the covers come with different designs, you can get different looks without buying a new pair of shoes every time! Unfortunately, you can’t buy just the covers from Zazzle. You have to buy the whole shoe. However, you can buy covers from Zipz website. When I saw these, I knew that I had to buy a pair! For those of you that are interested, I bought the White Quarterfoil Pattern Black Background low tops from my Zazzle shop. I will admit, when I first put them on I was worried that the zipper charm would cause a problem. Would it get caught on things? Would the charm make a continual clicking noise as I walked and become annoying? Would it keep hitting into my foot? Would things like dirt get in through the zipper? Would the shoes come apart when I didn’t want them to? Luckily, the zipper charm hasn’t caught on anything. Yea! Also, the zipper charm is far enough up on the shoe, that it usually doesn’t click against the ground. The only problem I’ve run into with zipper charm was at the movies. Apparently, after I’ve been sitting for a while, I position my foot sideways and the zipper charm did prevent me from doing that once in a while. 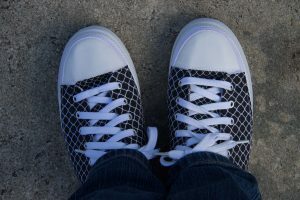 These sneakers are surprisingly comfortable! The first time I wore them was to Blue Springs State Park to see the manatees. (For those of you who don’t know, the spring stays a constant seventy two degrees. So, during the Florida cold snaps in December and January, the manatees hang out in the springs when the St. Johns River and surrounding water get to cold.) After walking around the park and enjoying the manatees and other sights, we then went to nearby Deland for lunch and walking around the shops. Needless, to say a lot of walking was done that day. I was concerned that since the shoes were new that they would hurt or cause blisters. Luckily, they didn’t. Yea! I’ve also worn these walking around an outlet mall, to the movies and to the beach. So needless to say, I’ve worn them over a number of terrains. They’ve been comfortable each time. 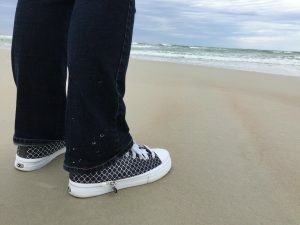 Just a warning though, while walking on the beach, I did accidentally get my sneakers wet. Although water did not get into the shoe itself, since the cover is made of cloth, that part did get wet and due to that my sock did get a little damp. Luckily, they did dry quickly. I was concerned that the zipper would come apart and the base would be constantly coming apart or dirt or other stuff would find their way in. However that is not the case. The base stays firmly attached to the cover. Since I haven’t bought any covers, I haven’t had a reason to unzip the base from the cover. Nor can I say how easy it is to attach the covers to the base. Over all, I would recommend these shoes if you are looking for a comfortable shoe that also looks good! Zazzle doesn’t sell covers, but you can buy them from the Zipz website. Please note that the Zazzle links are referral links.